South America. Map of the Northern Part of the State of Magdalena U.S. of Colombia. 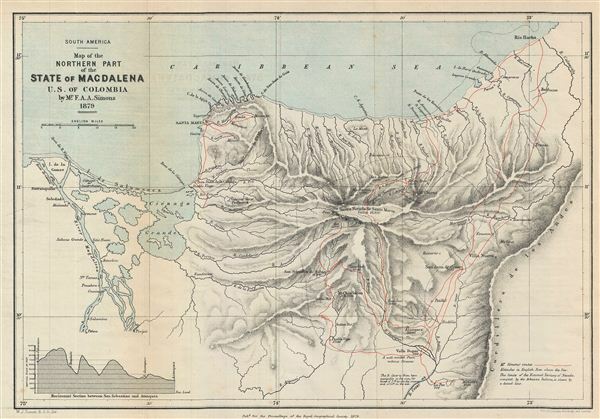 This is a fine example of the 1879 Stanford map of northern Magdalena, Colombia. The map covers the northern part of the State of Magdalena (now Department of Magdalena). A horizontal section between San Sebastian and Atanquez is depicted in the bottom left quadrant. Notes the mountainous regions known as Sierra Nevada de Santa Marta and the Island of Salamanca. Also features the Cienaga Grande de Santa Marta, one of the biggest marshes in Colombia, and Santa Marta, capital city of Magdalena. This map was prepared to illustrate the explorations of F. A. A. Simons, a Scottish explorer, whose trek across the Sierra Nevada added considerably to the, at the time, sketchy knowledge of the region. Various towns, cities, rivers, marshes, islands and other topographical details are also noted. This map was drawn by A. K. Johnston and published by e. Stanford with contributions from Mr. F. A. A. Simons, as part of the Proceedings of the Royal Geographical Society and Monthly Record of Geography, Vol. I, in 1879.